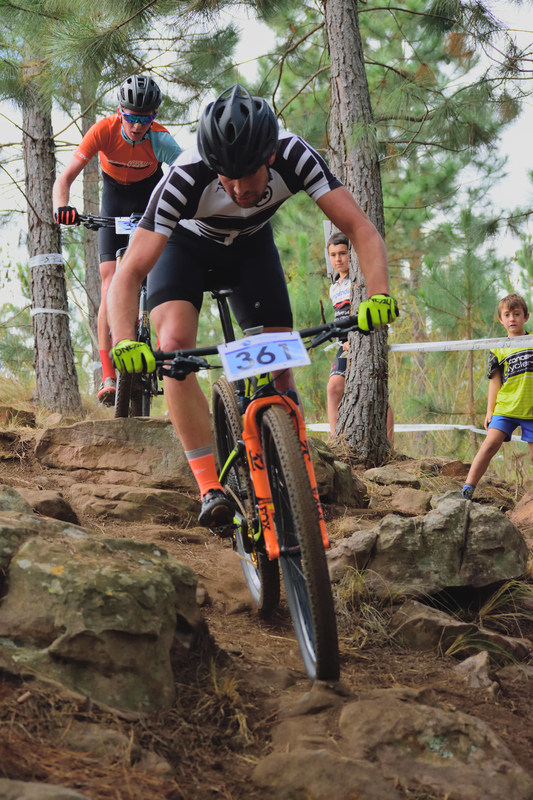 Defending champion Stuart Marais overcame a “silly” potentially race-ending crash to claim his third KZN Lap Challenge Mountain Bike Championship title at the Mazarat Park course in Waterfall on Sunday. In the women’s race, matric student Tiffany Keep put her books away on Saturday night and was in a league of her own the next morning as she cruised to victory to claim the junior title with Christie Leigh Hearder finishing second to take the U23 title. The men’s race was a tense battle for the opening three laps as Marais and U23 rider Henry Liebenberg battled for any advantage on the tough, technical track which is being used for a major event for the first time. On the third lap Marais managed to get a small gap and extended that on laps four and five to start his final 3,5km circuit with a healthy one-minute cushion. Halfway around the course the leader glanced over his shoulder to check that Liebenberg was not closing and nearly ended his race as he clipped a tree. Stuart Marais leads Henry Liebenberg down a technical section at the KZN Lap Challenge Championships on Sunday at Mazarat Park. The impact broke his brake lever off the handlebar and cracked his handlebar, leaving the 2016 and 2017 champion with a final two kilometres of tricky riding to negotiate with no front brake and a carbon handlebar that threatened to snap. He lost abut 20 second nursing his damaged bike over some dangerous sections, but still was able to come home 47 seconds ahead of Liebenberg to claim the title, while Liebenberg was an easy winner of the U23 Championship. 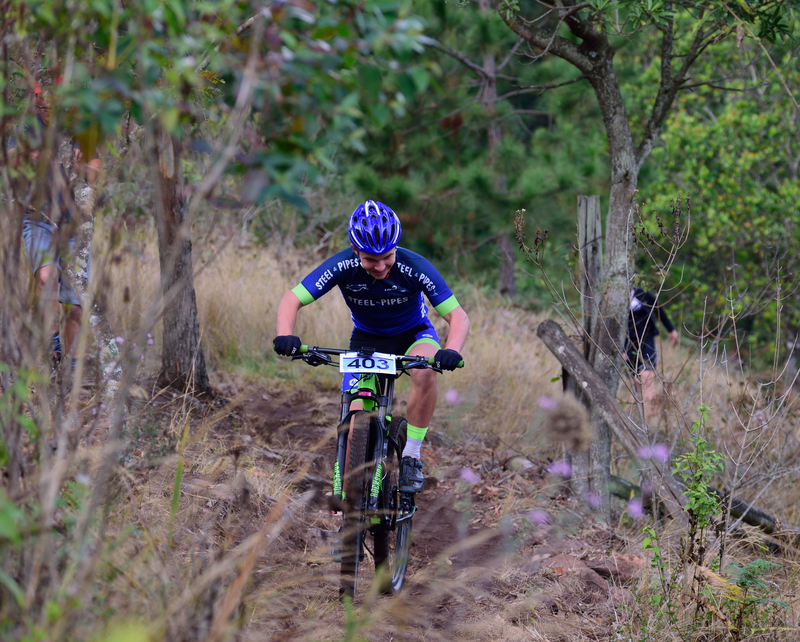 “I got off the start OK and into the first singletrack second behind Henry (Liebenberg) which was not terrible, but I wanted to lead into the first technical sections,” said Marais after finishing. “The first two or three laps we rode together and just kept it steady. “Then on the last climb at the end of the third lap I went hard and got a bit of a gap. I had seen he was starting to hurt so I put in a proper attack and got a gap. From there I just tried to keep it consistent. 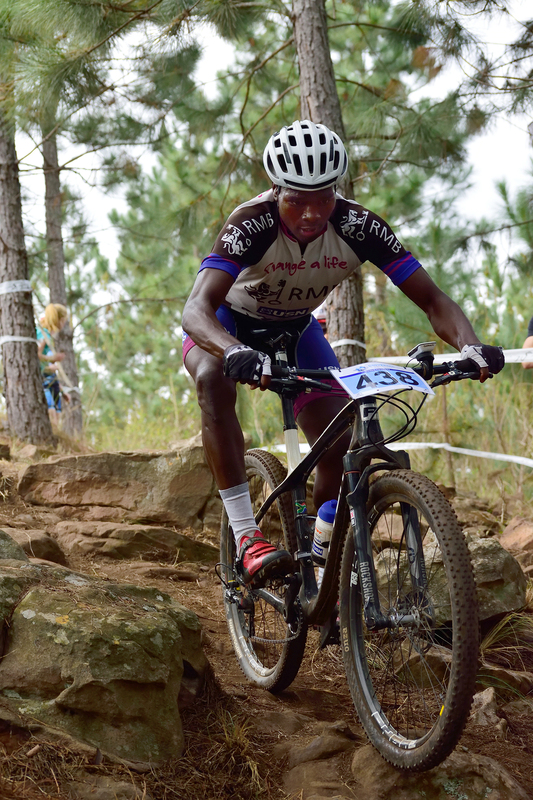 Sthembiso Masango drops though a rock garden at the KZN Lap Challenge Championships on Sunday at Mazarat Park. “But on the last lap I was looking behind me and I hit a tree. I snapped my brake lever off the handlebar and cracked my handlebar as well. So I rode the second half of the lap rather gingerly and some of those downhills were a bit sketchy,” added a relieved three-time champion. In the women’s race Keep, who wrote her NBT (National Benchmark Test) exams for university on Saturday, was able to ride away from the start and was never challenged as she cruised to a convincing win. Next weekend she will head up to the national marathon championships and hopes to claim the junior title and then the cross country title a week later. One family who enjoyed a great day at the championships was the Wright siblings. In the opening nippers and sprogs race (for under 10 and under 12 riders respectively), brothers Connor and Aiden, on holiday from Australia, raced to victory in their respective classes. The pair kept their membership of KZN Cycling despite the family emigrating to Australia and so will return “Down Under” with a pair of KZN Championship gold medals in their luggage. In contrast the Stander family had a day of near misses. Duane, who created the course and prepared it for the championship, finished second in the sub veterans, while his son Taylon was fourth in the nipper class and his father, Charles, was second in the grand masters.